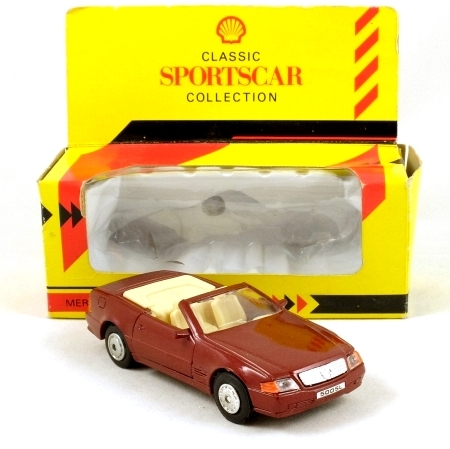 Metallic maroon with pale beige-cream interior with black steering wheel. Opening doors and tipping seat backs. Silver plated grille.' Glazed' front and rear lights, clear and amber at the front and amber at the back. '500SL' number plates. The rear axle is fitted with a pull-back motor. Black wheels with silver detailed centres. In mint condition, this model is in a fair-to-good window box which has some crumpling.